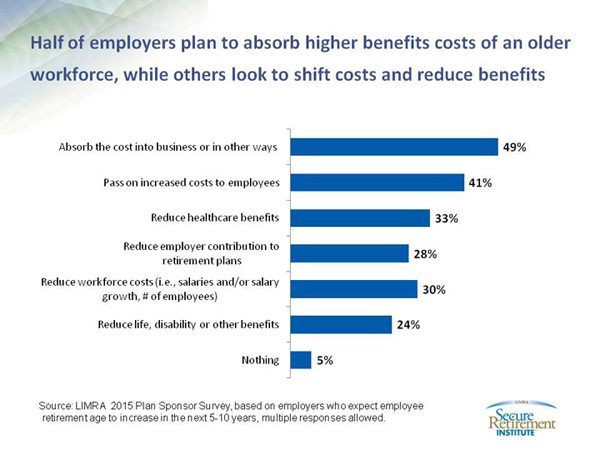 According to LIMRA Secure Retirement Institute, 73 percent of employers have planned for benefits costs to increase as a consequence of having older workers in their companies. Despite higher benefits costs, 9 in 10 employers believe keeping older workers on the job is good for business. Eighty percent of employers said that when older workers leave, the company loses experience, leadership and institutional knowledge. While leaving may be an employer concern, recent trends suggest older employees want to stay on the job longer for several reasons, most notably to increase their retirement savings. In a separate Secure Retirement Institute study, only 5 percent of workers in the study said they feel “extremely well prepared” for retirement. Among workers within 10 years of retirement (known as pre-retirees), 30 percent intend to work until age 66, while 1 in 5 are targeting age 70 or older for their retirement. At the same time, 60 percent of employers are concerned about the impact of later retirements on younger workers and their career paths. Nearly half said they struggle to address the different retirement planning needs for workers of various ages. 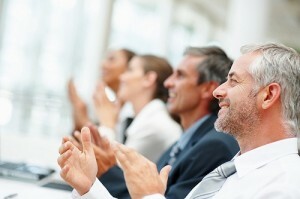 Seven in ten employers would like guidance from their plan provider on how to transition older workers into retirement. Half said they would use an advisor or consultant for this guidance. Most employers are looking at benefit plan design to manage both ends of the age spectrum and remain competitive to workers of all ages. Advisors have an opportunity to help employers achieve this balance with effective benefit plan designs for today’s diverse workforce. In addition, the latest LIMRA Podcast features a discussion on the changing environment of employee benefits. Three LIMRA researchers discuss the latest trends in 401(k) plans, health insurance and voluntary benefits. You can listen to the podcast here. « How Vulnerable To Hackers Are Mobile-Payment Apps?